Our NEW Visia gives you a 3D view of your skin. 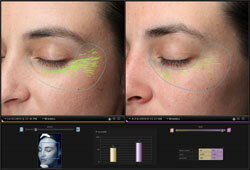 ​​The all new 7th Generation VISIA Complexion Analysis System delivers a significantly improved experience. A newly designed capture module rotates smoothly around your face, greatly simplifying the imaging process while providing greater comfort. Updated software allows faster image capture with automatic skin type classification, refined facial feature detection and more. ​VISIA's patented comparison to norms analysis uses the world's largest skin feature database to grade your patient's skin relative to others of the same age and skin type. Measure spots, wrinkles, texture, pores, UV spots, brown spots, red areas, and porphyrins. ​Compare results side by side for any combination of views, features or time points, including graphs and numerical data. 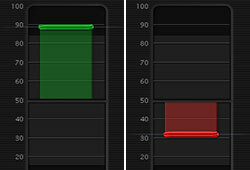 Zoom and pan images in tandem for clear and easy comparisons. 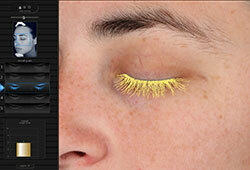 ​Evaluates the results of lash improvement treatments with numerical assessments and graphic visualizations. ​Visualize the skin's surface in three dimensions from any angle, rendered in natural skin tone, color relief, or gray scale. 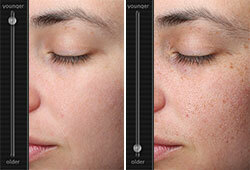 ​Simulate the aging process to show clients older or younger by 5-7 years for spots, wrinkles or both. 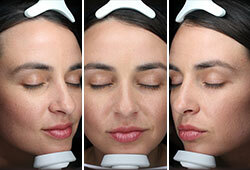 ​Zip through repeatable facial imaging for photo documentation without pausing to process the images. Analysis may be performed later, if desired. 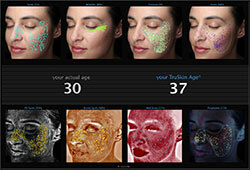 ​Automatic detection of the client’s skin type for streamlined image processing and feature analysis.